After tensions on the touchline had eventually been calmed, a further row erupted in the centre circle before play could finally resume. "I'm not annoyed with anything," said the Portuguese. "What happened was with Sarri's assistant. Sarri was the first one to come to me and say he would resolve the problem internally. "After that his assistant came to me in Sarri's office and apologised to me. I immediately told him 'if you really feel that way and you want to apologise, of course I accept apologies and forget it because I also made lots of mistakes in my career, so I'm not going to kill because of one'. "Forget it, it's over. He apologised and I accepted." Speaking to the BBC, Mourinho added: "It's not my reaction. It's Sarri's assistant's reaction. He was very unpolite but Sarri took care of the situation, he apologised immediately. "For me the story is over but don't do what everyone does and say 'Mourinho does things', it was Sarri's assistant." 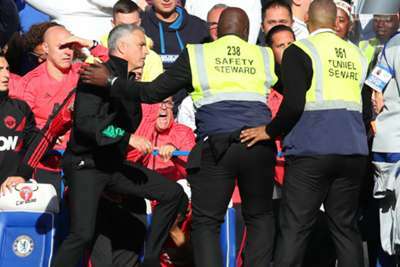 Asked if he had received the same level of respect he had shown to Chelsea, Mourinho said: "No, I don't think [I did], but that's not my responsibility. "I have a certain level of education, socially and in sport, and what I did here today I will do one day in Madrid, Porto, Milan and try to behave always in the same way which I did. Then the reaction of the fans is up to them."